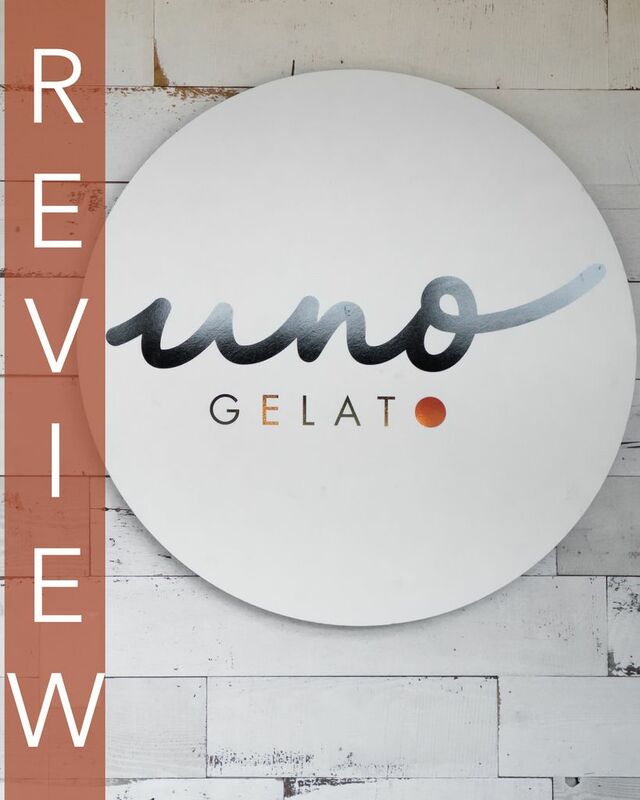 After a publicized falling out with his gelateria due to his estranged ex-partner in 2017, longtime gelato artisan James Coleridge is back in the Vancouver gelato scene with Uno Gelato, a group of gelaterias the decorated gelato maestro plans to open around the city. With the first location already open at Stamps Landing along the Vancouver Seawall, I thought I'd stop by for a quick lick of the new concept. The gelato here is made with Avalon milk, so anyone who loves the taste of Soft Peaks (Gastown or Burnaby) will probably enjoy the gelato base here too. Selection-wise, there was nothing that wouldn't be available at Bella Gelateria, so I assume that a similar vibe was being sought for this menu. The flavours are similar, though the prices for Uno's regular flavours are marginally cheaper if you're a cone lover (Bella has a surcharge on cones). The white coffee flavour was a cool choice though. Normally coffee flavours are tinted brown, but that was not the case here. The akbar mashti flavour had a pistachio rose flavour which I also enjoyed. Following the trends of Vancouver, charcoal was a cone option, so if that's your jam, it'll add a cool contrast to your gelato. Uno Gelato has a few locations in Vancouver despite being a new gelato spot in town. The first to open was at Stamps Landing and the gelateria takes up a small space in the Mahony and Sons pub. Similar to Bella Gelateria, you can sample as many flavours as you need before making a choice. Vegans are also accommodated on the Uno menu, as nearly half the options are vegan-friendly. One thing I dislike about the Bella experience is the customer is directed to purchase their gelato prior to sampling. I always felt this was a bit restrictive for the customer. At Uno, you are free of this stipulation. Seating-wise, there is only outdoor seating (roughly 12 seats) with a portion of the Mahony and Sons deck cordoned off for Uno Gelato customers. I'm not sure how this will work with rainy days, but you might be out of luck if you want to escape the elements while enjoying gelato. This just in: James Coleridge responded to my photo on Instagram. At Uno Gelato, you'll sample your flavours and pay for your order as you receive it. The one staff member was a little sparse for a late summer day, but she was kind and took care of all our questions. One subtle flag for me was that during service, the staff member accidentally dropped a gelato scooper onto the ground. They looked at it for a second before picking it up, placing it back into the rinser, and grabbing another scooper to grab our gelato. I didn't get sick or anything from my gelato, but this is the sort of thing I would prefer alternative action. In my opinion, if something drops to the floor, it deserves to be washed. Another thing that was a little off was that the blackboard menu displayed fewer flavours than what was actually available. For example, matcha was an available flavour when looking at the tubs of gelato, but matcha was absent from the menu. Not a deal breaker but it's a bit annoying to cross-reference sources of information Hopefully this is something they can address more attentively. The most notable excitement about this new gelateria is that it's founded by a certified gelato maestro. If you're a fan of Bella Gelateria, you'll probably enjoy this new brand of gelato too. Flavour-wise, nothing is really new, but sometimes you just want high-quality gelato.